Who Should Take This Yoga 4 Teens Teacher Training Course? Yoga teachers interested in organizing classes for teenagers. Teen yoga teachers who want to improve their classes. Teachers who want to offer yoga in their school or program. Yoga practitioners who want to create a yoga class for teenagers. Parents who love yoga and want to start a teen yoga class. Coaches & PE teachers looking to improve team flexibility, teamwork, focus, relaxation and more. Dance & theater teachers looking to improve student flexibility, teamwork, focus, relaxation and more. Supervisors & social workers to teens at-risk for programs providing teen relief and empowerment. Anyone who is interested in teaching yoga to teenagers! This course prepares adults for how to teach teenagers yoga. Broken up into 9 sessions, Yoga 4 Teens Teacher Training Video Course is a 15 hour commitment using session outlines & proprietary material, streaming video discussions, and follow-up quizzes to get you certified and ready for teaching yoga to teenagers. It is geared for adults who enjoy their yoga practice and want to reach teenager in a profound way, through yoga that is meaningful and fun for teenagers. YogaMinded Teen Yoga Teacher Training Certificate. 15 hours of CCE credits with Yoga Alliance. UNLIMITED access to the content for the nine-session course, 3-10 topics per session with NO EXPIRATION DATE. 60 minute sample class of Christy teaching yoga to teenagers (streaming video) plus post-class discussion. 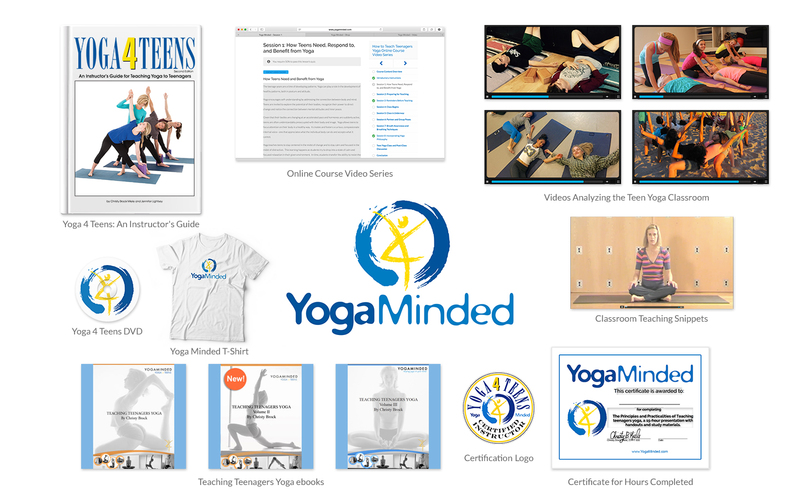 16 separate downloadable handouts with detailed preparation for the teen yoga classroom. Nine quizzes, one for each module of learning. "The book is a fantastic reference and tool that you will use over and over." "The Yoga 4 Teens: An Instructor's Guide for Teaching Yoga to Teenagers is a wonderful way to learn the unique techniques of teaching teens." "This book has become my yoga training Bible!" Teaching Teenagers Yoga eBooks (Volumes 1,2, 3). The Teaching Teens Yoga ebooks offer general advice, reflections and teaching tips as they apply to the teen yoga classroom. Innovative teen yoga teachers are featured in interviews and articles which provide descriptions of their philosophies and classrooms. Collectively, the eBook series contains over 200 pages with more than 50 articles. Be inspired by the short articles and vignettes as well as highlights of over 20 teen yoga teachers. YogaMinded White T-Shirt. These shirts for women are made of a 50/50 cotton blend. Soft and form-fitting (not baggy), they are especially good to wear while practicing yoga with teenagers, as one can explain the "yoga 4 teens" YogaMinded logo. Yoga4Teens DVD. Instructional, informative, and inspirational, this DVDis perfect for teenagers, parents of teenagers, and anyone interested in conducting a teen yoga class. Benefits of the poses, reminders while practicing, and Sanskrit names of the poses are included. Yoga Journal calls Yoga 4 Teens a "dandy practice companion" and an " informative how-to-teach-teens manual for yoga teachers who work with (or hope to work with) this age group." This streaming video contains a one-hour instructional class, a 40-minute practice flow, and a special interview section with teenagers. Classroom Videos. These three streaming videos provide a rare glimpse into authentic yoga classrooms with talented and experienced teen yoga teachers. They are edited with voiceovers to alert teen teachers of poignant observations in teaching style and substance. Each video is about 20 minutes in length. Webinar Presentation. A recorded presentation with powerpoint slides via streaming video, this one hour teen yoga training covers principles and practicalities of handling teen yoga classrooms that can be applied to any teen teaching situation. "Awesome! You covered so much in this presentation and gave some great examples." "Thank you, Christy. Your webinar was helpful for me to achieve my goal of getting started for a new class series I'm going to offer teens next month. I learned many applicable points specific to teaching teens and I feel more prepared and even excited. I'd recommend this webinar for anyone interested in teaching yoga to a teen population." For each of the nine sessions of learning, a student reviews 2-4 pages of online content, watches the streming video (which vary in length from 20-65 minutes), then takes a quiz before moving on to the next session. The course instructor (Christy) receives your quiz and returns it with feedback to your answers. Upon completing all nine sessions, students view the concluding video and can proudly display their YogaMinded Yoga for Teens Training certificate, as well as count your hours toward yoga alliance credentials. The online course parallels the training of five women who were filmed taking the course. Their questions and comments are worthwhile and the conversations we have with each lesson are rich and interesting. Different than a traditional weekend training, the online course allows for the advantage of being able to take the lessons on your own time. Once purchased, you can view the course and study the material as many times as you like. The modules of learning were designed to help teen yoga teachers get a strong foundation for effective teen yoga teaching. We set up the big picture in this introductory session, discussing the stresses that abound for teens, the benefits that yoga provides, and how teenagers are apt to respond. We will take a detailed look of unique behavioral characteristics of a yoga classroom of teenagers, as compared to adults and children. Additionally, the importance of recent adolescent brain research is highlighted as it relates to the teen yoga classroom. In the second session, Preparing for Teaching, we review in detail essential principles for being a successful teen yoga teacher. We discuss what teaching mindsets will get teens to positively respond, both in terms of classroom behavior as well as getting them to embrace the yoga practice as their own. This session seeks to empower teachers by orienting them towards a teen teaching mindset. The purpose of this teaching session, Reminders before Teaching, is to provide essential coaching tips to create a meaningful teen yoga class. Basically, this session covers the last minute pep talk as well as a detailed guideline summary before teaching teens yoga. In this session, we seek to establish immediate and lasting connection with students and to consider creating a safe classroom for teaching yoga poses. This session, Class Begins, provides a teen yoga teacher with tools and ideas of how to approach the first half of a yoga class. Certain yoga poses and lots of teaching techniques are discussed to get class started in a way that engages teen interest, while also setting a peaceful and respectful tone. Several fun teaching games are shown that keep teen's attention and expand their interest and curiosity. Expect your teen teaching toolbox to get filled in this learning module. In the Class is Under Way session, the methodology of engaging teen interest in the yoga poses is further explored. In addition, six different teacher assists are shown which teen teachers can employ to improve their student’s posture and sensitize them to the healthy actions the yoga poses require. Also covered are the most important restorative poses for teenagers. In this module, your approach to teaching teens will be better informed, options for safe touch and adjustments may inspire you, and the quiet relaxation of restoratives will beckon your teen teaching. The session on Partner and Group Poses provides background information and explains the benefits of each. Fundamentals for teaching are explained and the video lesson shows eight partner poses and six group poses that have proven to delight teenagers. Our participants experience these poses together (for the first time) and you can learn how to apply these poses in your own classroom. Partner and group poses are especially important for the teen demographic, given their social nature. In the Breath Awareness session, we discuss effective ways to introduce breath awareness to teenagers. The top four breathing techniques to introduce to teens are reviewed, along with a talk about including meditation in the teen classroom. Essential to teaching yoga to teenagers is yoga philosophy and how to lead teens toward gratitude, self-reflection, self-acceptance, and compassion. In the Yoga Philosophy session, we discuss subtle and overt ways to do just that. Many insights are to be gained in this conversation for how a teen teacher might bring yoga philosophy to life in her/his classroom. In the session Teen Yoga Class and Post-Class Discussion, Christy teaches a full hour-long yoga class to four teenage girls. Students will see the principles and practicalities of teaching teenagers yoga in action and will gain insight and appreciation for how they actually work in the teen yoga classroom. A rich and thorough review of the teen class is given in the post-class discussion. Course takers will be asked to consider what insights are to be gained from the viewing. Because there is so much more content provided in addition to the course (including the Yoga 4 Teens Instructor's Guide, the Yoga 4 Teens DVD, the Teaching Teenagers Yoga ebooks, the classroom videos and the webinar presentation), the hours of teen yoga teacher training and study could be 25-30 hours or even more, depending on how much time a student wants to commit. The YogaMinded resources will be made available FOREVER with not time limits. Each session is followed by a quiz to check learning and to engage in the preparatory process of teaching teenagers yoga. Quiz questions vary in format including true/false, multiple choice, fill in the blank, and short explanations. Upon completion of each quiz, answers are submitted to the course instructor who grades it and provides feedback. It is also possible to move through the course without taking the quizzes. Having said that, the quizzes add an engaging dimension to the training. They ask for your commitment to the course material, stimulate your brain to integrate the information, and engage course-takers to embrace their personal commitment to teen yoga. As a result of taking the quizzes, course-takers will have more clarity in their vision as well as more comfort in their teen teaching voice. Teenagers benefit greatly from being introduced to the self-management tools of yoga and mindful movement. It is rewarding and enjoyable to teach them PLUS they REALLY NEED US! See our Benefits Chart for details on how you can help teens cope, prepare, motivate and thrive.